A baby elephant born at Portland’s zoo last week may be fated to a life with a controversial travelling elephant show that rents out pachyderms to the entertainment industry, stages circus like events and offers elephant rides at $500 an hour, The Seattle Times has found. The newborn calf is the property of a private company, Have Trunk Will Travel, of Perris, Calif., which assumes ownership of the newborn within a month. Last Friday’s birth of a 300-pound Asian female at the Oregon Zoo sparked public celebration and generated national news. The zoo industry promptly declared the event a victory in its quest to preserve and propagate an endangered species. But the newborn calf doesn’t legally belong to the Portland zoo. Instead, it is the property of a private company, Have Trunk Will Travel, of Perris, Calif., which assumes ownership of the newborn within a month, according to a contract between the Oregon Zoo and the company that was obtained by The Times. Oregon Zoo officials quietly cut a deal to give up the second, fourth and sixth offspring between Rose-Tu, owned by the zoo, and Tusko, a prolific male owned by Have Trunk Will Travel. Last week’s birth was the second offspring between the pair. The Times’ discovery of the breeding contract highlights the dark side of elephant captivity, in which zoos are desperate to breed more elephants at any cost. The Times reported this week in a two-part series, Glamour Beasts, that elephants are dying out in America’s zoos. Zoos have depended on elephants as crowd pleaser’s and revenue generators, but for every elephant born, on average two others die, a Times analysis has found. Since 2005, the industry’s trade group, Association of Zoos and Aquariums (AZA), has aggressively promoted breeding efforts to counteract declines in captive elephant populations. Just 288 elephants remain inside 78 U.S. accredited zoos. 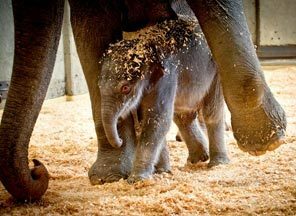 Kari Johnson, who co-owns the business with her husband, Gary, confirmed Monday that Have Trunk Will Travel owns legal rights to the newborn under a contract signed with the Oregon Zoo in 2005. Details of the newborn’s future have not been worked out, she said. At a Tuesday morning press conference, zoo director Kim Smith said the zoo is negotiating with the company to take ownership of the calf. She expects the calf to live at the zoo permanently. But under terms of the contract, the zoo does not have the power to keep the elephant if Have Trunk Will Travel wants to take possession. The contract, signed in June 2005, stipulated that Have Trunk Will Travel would transfer their male elephant, Tusko, to the Oregon Zoo. Records show that Tusko, now 40, arrived the following month; he remains at the zoo. Because elephant gestation takes 20 to 22 months, breeding males may stay at zoos for many years. Have Trunk Will Travel owns five Asian elephants, ages 27 to 47. In 2010, its 4-year-old Asian male succumbed to the fast-acting elephant endotheliotropic herpes virus (EEHV), which may spread by contact and kills only elephants. “The baby that died was called JP, he was the fourth baby elephant to be born at Have Trunk Will Travel, Rose-Tu his mum, was not able to conceive naturally, so JP’s birth was achieved through artificial insemination. As a result, the travelling show is free to breed its elephants and exchange off spring with most U.S. zoos. After Friday’s birth, keepers put the female newborn in a rope harness in case they needed to quickly pull her away from her mother. But Rose-Tu and her daughter bonded smoothly, officials said. Everything in this video was filmed at Have Trunk Will Travel, of Perris, California. HTWT supplies trained elephants for movies, advertising, personal appearances elephant rides, fairs & other public appearances. After a year of political wrangling and opposition from Toronto Zoo staff, city council has reaffirmed its decision to send the zoo’s three ageing elephants to the Performing Animal Welfare Society (PAWS) sanctuary in California. Zoo management, who had opposed the move, indicated after the 32-8 vote that they will abide by council’s edict. One of the Toronto Zoo’s elephants wanders near a transport crate placed in the elephant paddock for the animals to get used to. A year after the decision was made to send the last three to California, only to meet with strong opposition from Zoo staff, the original decision has been reaffirmed. “I think it’s disappointing but we also have to accept the decision of council and move on,” said John Tracogna, the zoo’s chief executive officer. Council has had the benefit of receiving a lot of information over the past year. It still thinks the sanctuary is the best place, and zoo management is now prepared to accept that, Tracogna said. 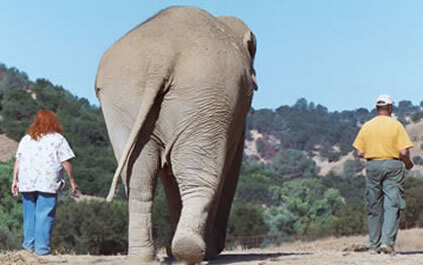 Zoo staff vehemently disagreed with council’s decision in October 2011, in part because of PAWS’s lack of accreditation from the Association of Zoos and Aquariums, and then because of concerns about disease at the sanctuary in San Andreas, Calif. Staff hoped to send the elephants to a new, accredited sanctuary under construction in Florida instead. “There was concern around tuberculosis at the facility,” Tracogna said. “But council’s heard all this and made their decision so we have to respect that. He noted that there are logistical hurdles to overcome, and stressed it’s up to PAWS to come up with an acceptable plan to fly the elephants westward. “A good part of it is having a sound transportation plan that is going to move the elephants safely,” Tracogna said, adding he believes retired game show host and animal advocate Bob Barker, who had offered to pick up transportation costs, is still willing to do so. Tracogna couldn’t give a timetable to move the elephants, but councillors who pushed for the move want to see it happen as soon as possible. “We just want to do what’s best for our elephants, and that’s what we did here today,” said Councillor Michelle Berardinetti, who has fought hard for the move. Not so, said Councillor Gloria Lindsay Luby, who fought the move. “They’re sending them to a facility that’s got TB, active TB. Why would you do that?” she said. Adopting a PAWS animal helps us provide nutritious food, veterinarian care and an enriching habitat for your animal — and you’ll have the satisfaction that comes from knowing you’re making a difference in the life of a PAWS animal. The Humane Society of the United States has released the results of an undercover investigation into an Oklahoma exotic animal park, where an investigator recorded tiger deaths, unwarranted breeding and dangerous incidents involving children and adults. HSUS undercover video footage taken at GW Exotic Animal Park in Wynnewood, Okla. in the summer and fall of 2011 shows potentially illegal actions that imperil both animals and humans. GW Exotic Animal Park houses approximately 200 tigers and other dangerous exotic animals and is acting as a petting zoo and traveling zoo that breeds tiger and bear cubs and allows the public to handle exotic animals for a fee, both at its own facility and at shopping malls and other venues around the country. Today, The HSUS filed a series of complaints with state and federal authorities regarding potential legal violations, and called for strengthening certain areas of the law dealing with dangerous exotic wildlife. Toronto Zoo Elephants Need Your Help! preciousjules1985	animals, AZA, Elephants, In Defense Of Animals, PAWS, Petitions to sign please, Wild Animals, Zoo	Aquarium, Association of Zoos and Aquariums, AZA, California, Elephant, Thika, Toronto, Toronto Zoo	Comments Off on Toronto Zoo Elephants Need Your Help! 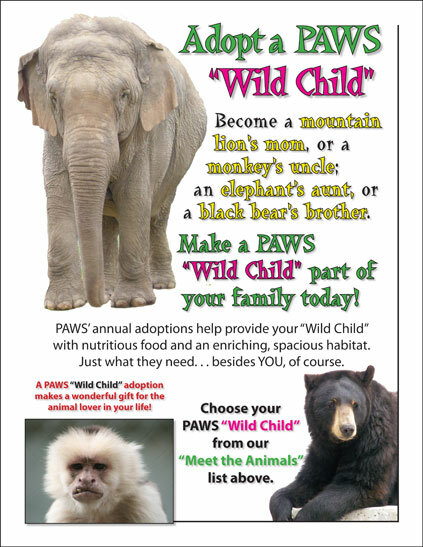 The elephants at the Toronto Zoo – Iringa, Toka and Thika – need your help again. The Association of Zoos and Aquariums (AZA) revoked the zoo’s accreditation last week because of a plan to send the elephants to a sanctuary. Now, some City of Toronto Councillors are wondering if they made the right decision when they voted to send the elephants to the PAWS Sanctuary in California. Don’t let the AZA get away with these bully tactics meant to stop the transfer of the Toronto Zoo elephants to a large, natural-habitat sanctuary, and to intimidate other zoos that may want to do the same for their elephants. Tell the City of Toronto Councillors that the world is watching! Send a message to the City of Toronto Councillors, urging them to stay the course and send Iringa, Toka and Thika to the PAWS Sanctuary. The Feline Conservation Federation (FCF) warns that House Bill 4122, which makes it illegal to own, possess, or breed lion, tiger, leopard, jaguar, cheetah, puma or snow leopard, will cause great harm to captive conservation, and leave little opportunity for Americans to view and learn about great cats. Representative McKeon introduced HB 4122, which exempts only members of the American Zoo Association (AZA) from the ban on breeding big cats.